I like to keep my vintage bicycle library stocked with both old and new volumes. This book, published by MIT in 2014, caught my eye on a trip to my local Powell’s. 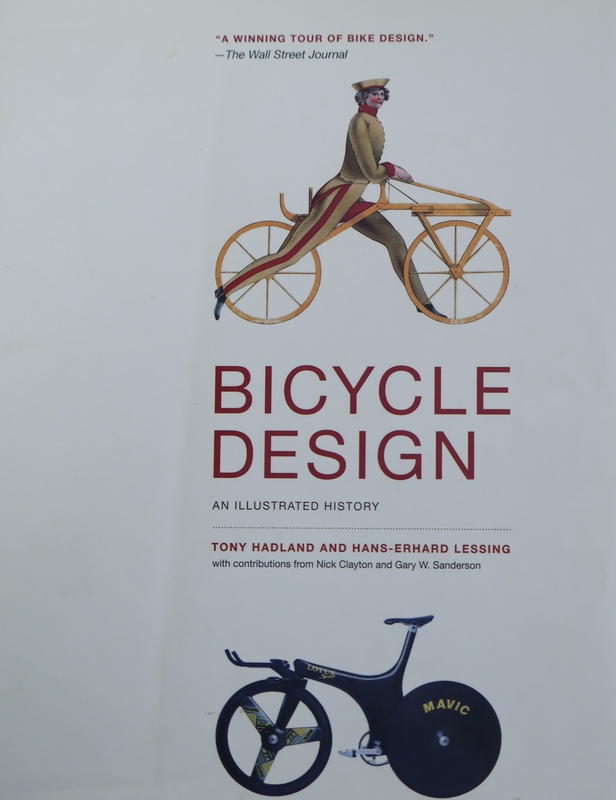 Bicycle Design was written by Tony Hadland and Hans-Erhard Lessing, the latter being a physics professor and Hadland being a Raleigh and Moulton expert and author of a number of cycling books. This is a book dedicated to the science and design of the bicycle and its components, with an extensive discussion of historical developments and many interesting illustrations and photos. The entire first half of the book is well worth the admission price I paid – about $35. There is a fascinating discussion of wheel design and development which includes spoking patterns and engineering concepts. There are so many interesting engineering designs and cycling innovations in this book that it is hard to single out notable developments. The book is organized topically, except for the first chapter which deals with Velocipedes and their forerunners from an historical perspective. The remaining chapters address drive train, wheel engineering, braking technology, and transmission, before launching into chapters organized by accessories and applications. 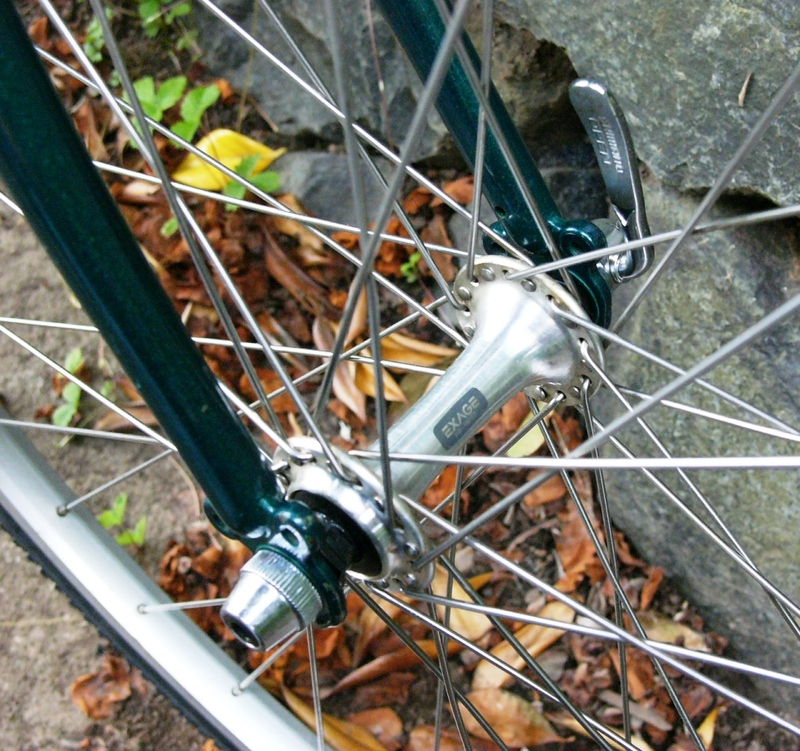 One topic that can be challenging to vintage bicycle enthusiasts is an understanding of the wheel rim designs of the day. Westwood rims are designed for brakes which will engage the rim rather than the sidewall, while Endrick rims can accommodate brakes which engage the rim sidewall. One fascinating innovation described in this excellent resource is Hanson clipless pedals shown above. 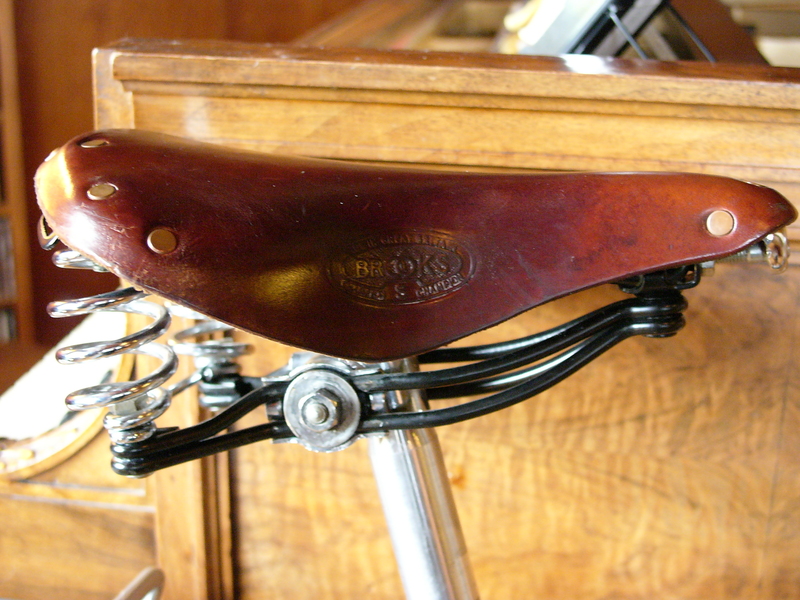 At the time, various manufacturers were experimenting with shoe/pedal attachment options. Another idea involved a magnetic shoe/pedal attachment, developed in 1897 by Henry Tudor of Boston (US patent 588,038). Mafac, Resilion Cantis, modern cantilevers, courtesy of Bicycle Design p. 277. This book includes discussions of most historical cycling developments. 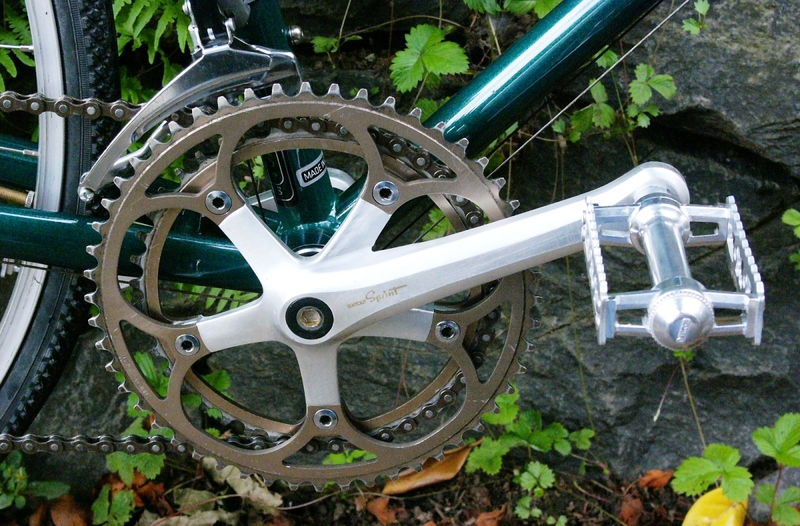 However, the authors note their one glaring omission: derailleurs. Because derailleur history has been discussed by a number of other authors, that topic is given cursory treatment in Bicycle Design. If you don’t already have a copy of this tome, I recommend adding it to your library. I have used quite a few cycling bags over the years. But, bags and panniers can be tricky. How well they work depends not only on the mounting system designed for the bag, but also on what kind of rack system you have, or whether you have racks at all. And, for saddlebags, the question of whether they will work for you depends a great deal upon your bike’s rear triangle geometry, as well as whether or not your are using fenders. In order to use front bags and panniers you need not only to have a front rack, fork braze-ons, and handlebar or stem mounting system, but the success of carrying a front load also hinges on whether your bike has the right front end geometry to carry a load there. I have always had a special obsession with bike bags, which started back in my touring days when I would load up my 1976 Centurion Pro Tour and head out to explore my surroundings. 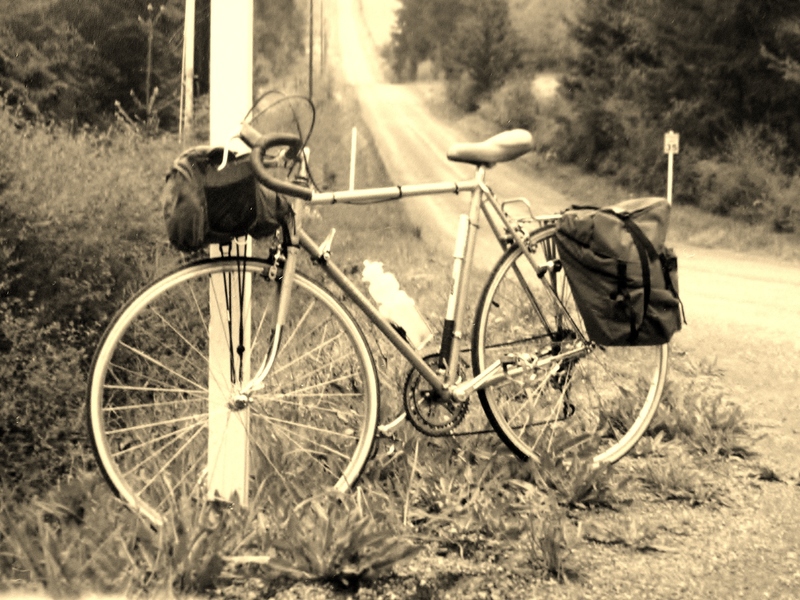 I was happy that my handlebar bag and rear panniers were purchased from REI – a consumer cooperative being somewhat radical back then (even though REI was founded decades earlier). 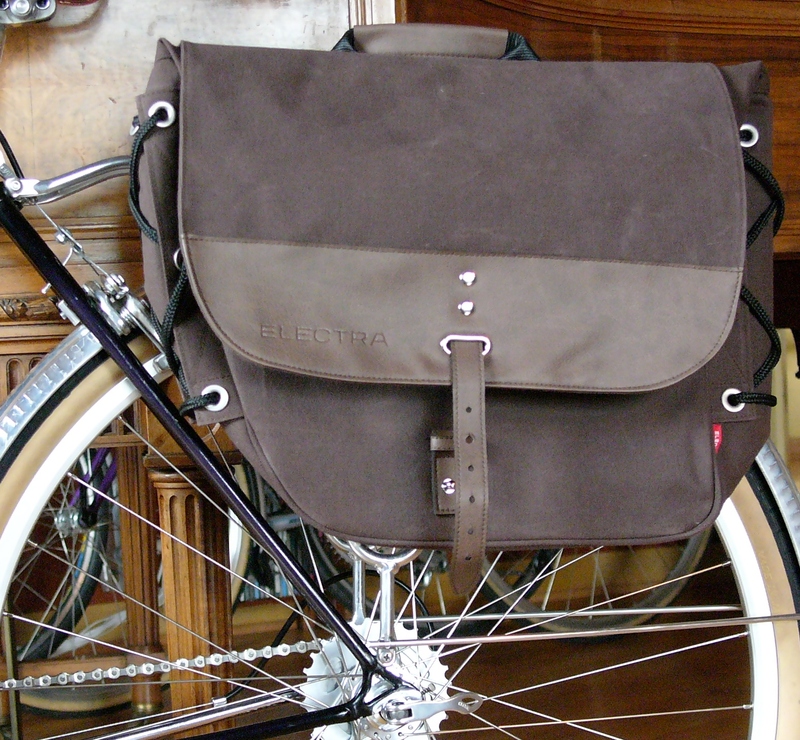 The handlebar bag mounted with a removable rack which rested on the handlebars and stem. The lower part of the front bag was secured to the front dropouts via a stretchy cord, which as you can see in the above photo, got overstretched so that I had to tie a knot in the cord to keep tension on the bag while underway. 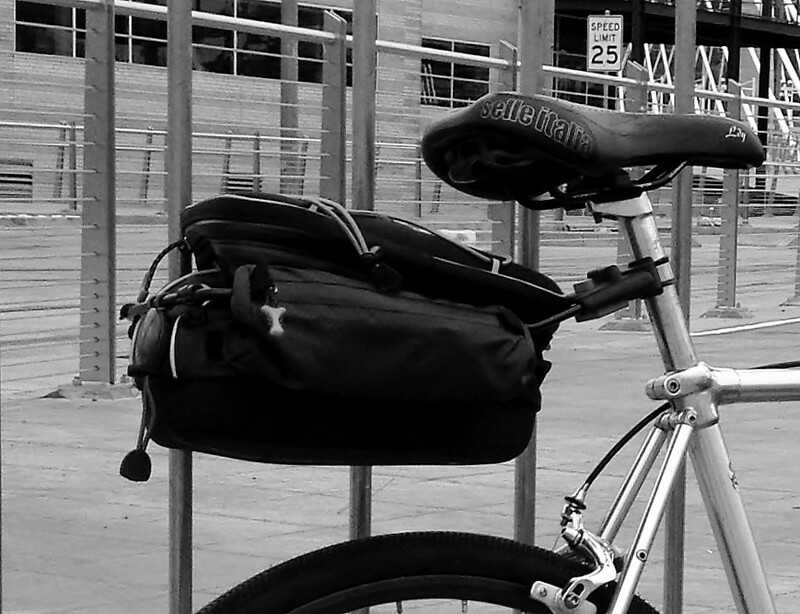 I liked the rear panniers, but didn’t like the front bag so much. It interfered with the beam of my battery powered head light. And, probably the Pro-Tour’s geometry was not ideal for carrying a front load. 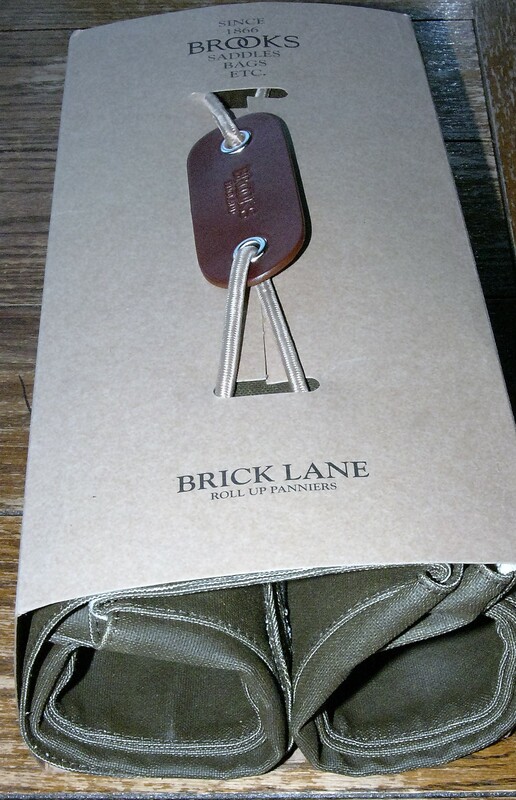 However, one nice feature was the map case on the top of the bag. In those pre-iPhone days, having my maps at the ready proved invaluable, although I will say that often my maps were totally wrong! 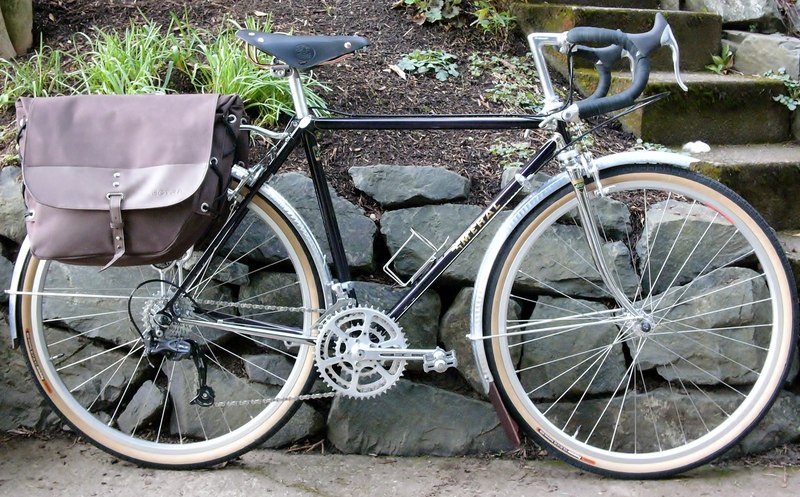 Eventually I stopped using front bags altogether until I began building up my 1980 Meral as a 650b Randonneur, a few years ago. Even so, I am not all that thrilled with front bags, finding them fidgety, noisy, and irritatingly intrusive on my hands. Perhaps a decaleur could solve these problems. 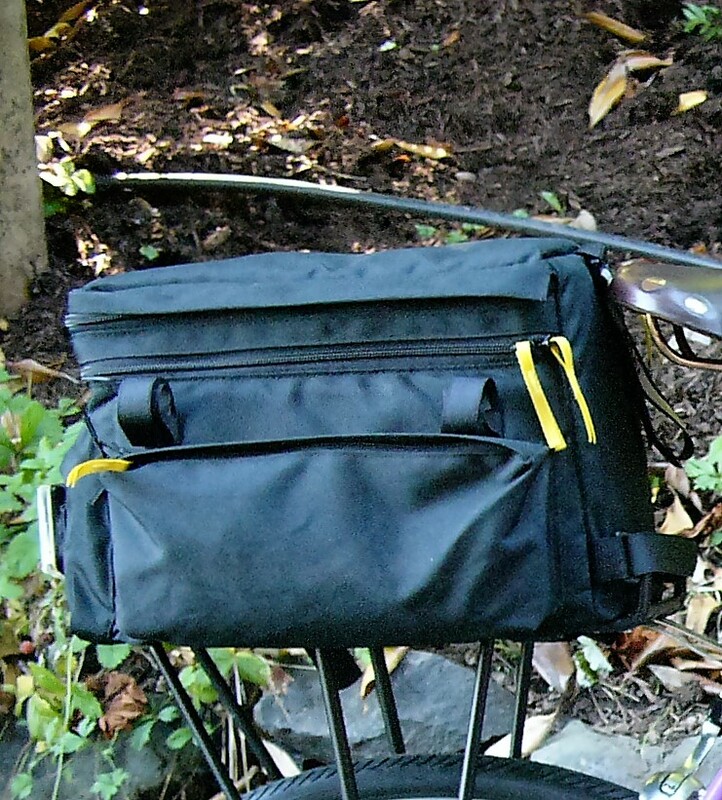 But, for now, I only occasionally use this really nice Velo Orange front bag. 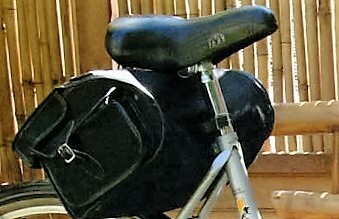 I have not used low rider front panniers, but have occasionally used small panniers mounted to the front racks of various bicycles I have ridden. Mastering a front load requires a bit of saddle time. IMHO, Jandd is the gorilla manufacturer of cycling bags. Their bags last forever. They never wear out. 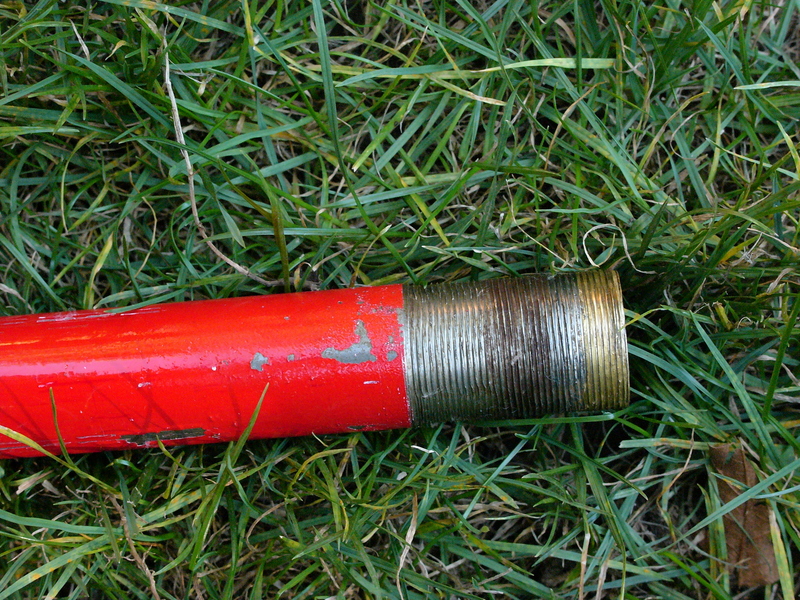 They are intelligently designed and reasonably priced, given their longevity. They are not particularly pretty, but offer the best in bike bag value and utility. 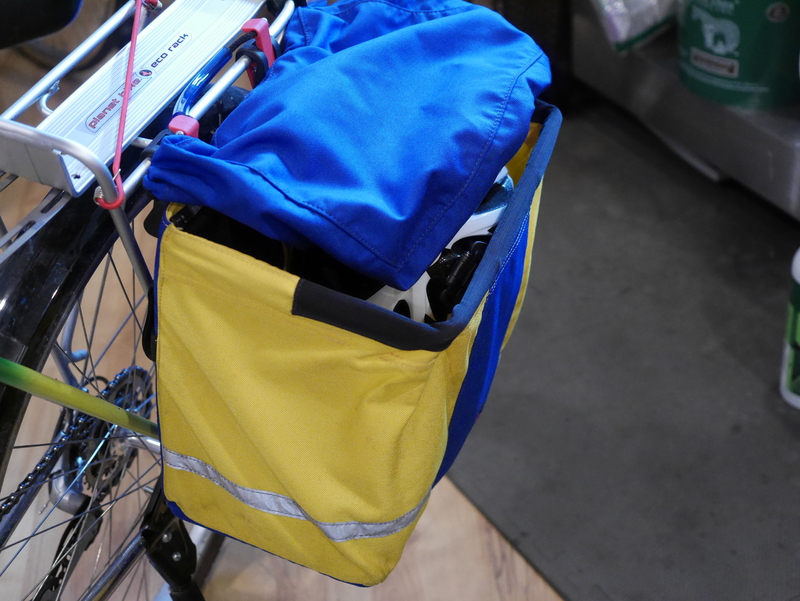 Grocery panniers – large, securely mounts to most racks, holds an actual grocery bag, unlike other competitors which are much smaller and less robust. I have a set of Jandd grocery bags that I purchased in the early 90’s and they are still in use. 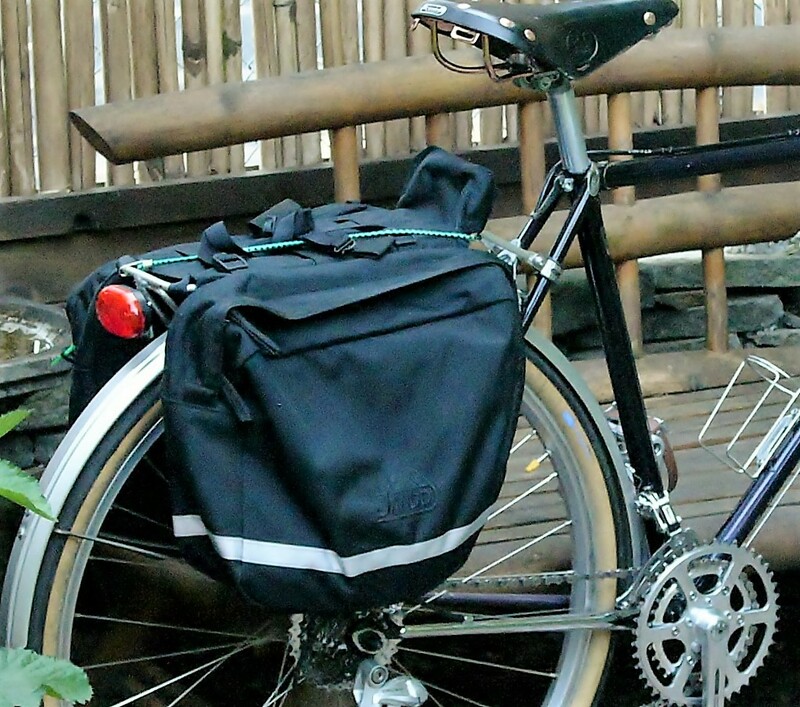 Hurricane panniers – These are the grocery panniers on steroids. Excellent mounting, total weather protection, tons of visibility. But, there are also very heavy weighing about 2 lbs each, unladen. I use these on my Panasonic winter/errand bike. A perfect utility bag. Jandd Trunk rack bags – I used a Jandd trunk bag for many years. It never wore out, and I finally gave it to a friend, as I don’t use trunk bags any more. 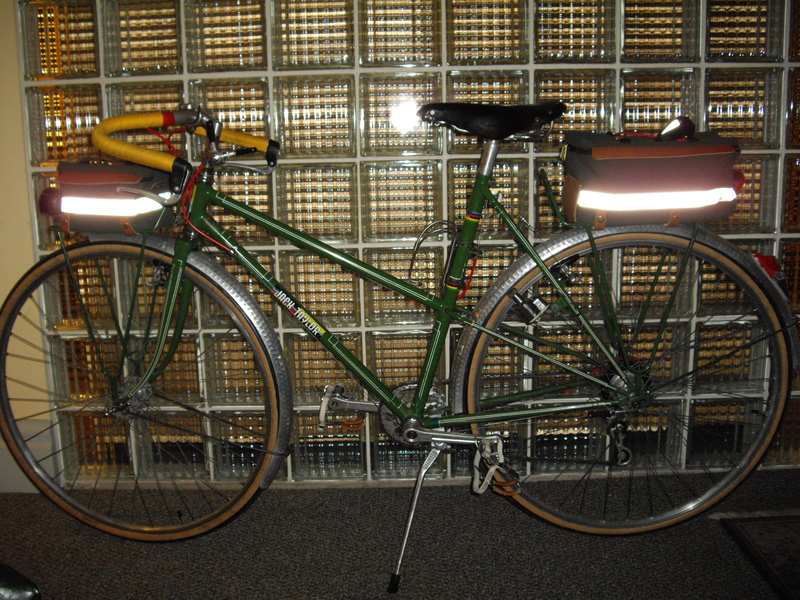 Jandd Throw-over small panniers – I am using these “small” panniers on my 1980 Meral. They are deceptive in nomenclature and appearance – I have managed to jam all kinds of stuff into these bags. Lightweight, fits any rack. 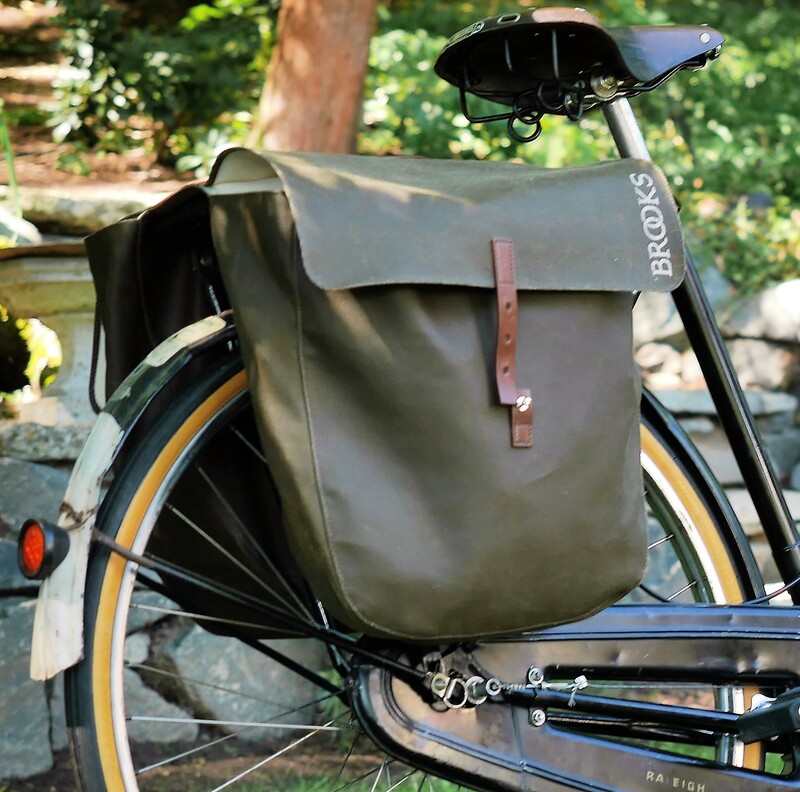 Brooks Roll Up Panniers – who can say anything bad about a Brooks bag? These are beautiful bags, with appropriately lovely packaging. They are NOT waterproof, and they do not have any attachment at the base of the bag. I am using these on my 1950 Raleigh Sports Tourist, which is perfect for what they are designed for. 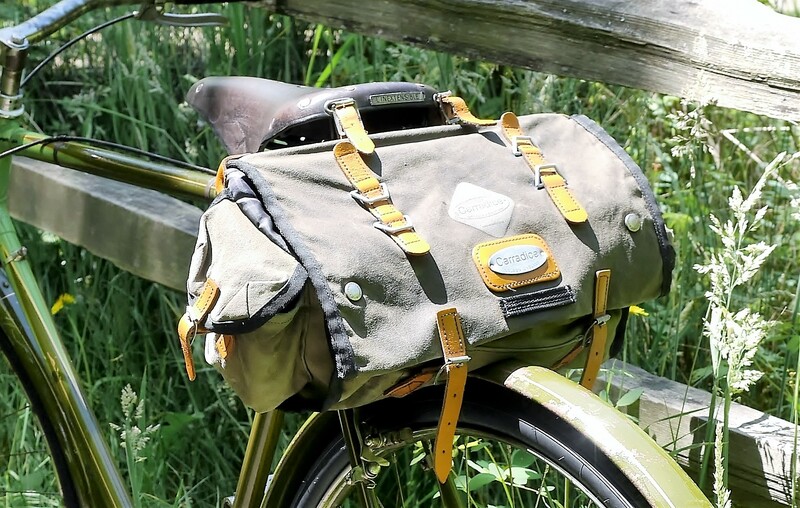 Various “roller” models – Ortlieb bags are the perfect Portland commuter bag, being totally waterproof, easy to mount on any rack, and with a lot of visibility. Newer models have internal organizing pockets. 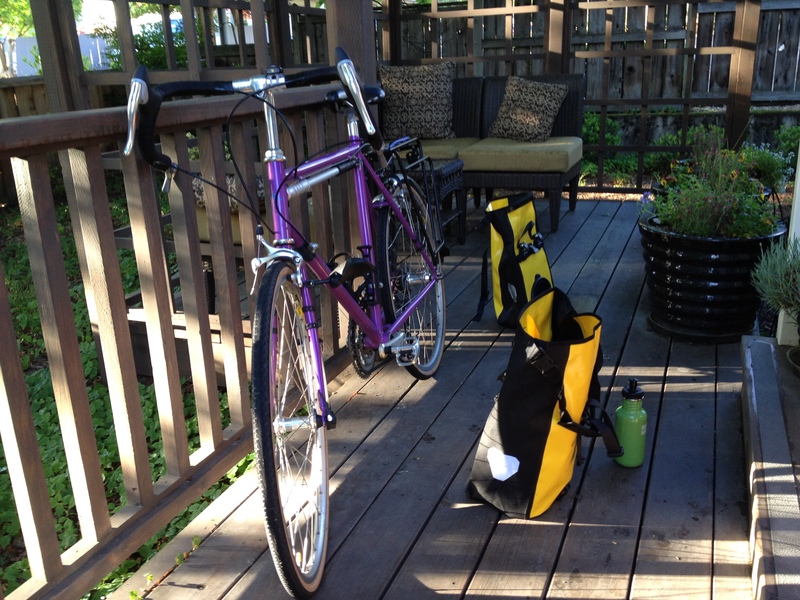 These are my commuting bags of choice. 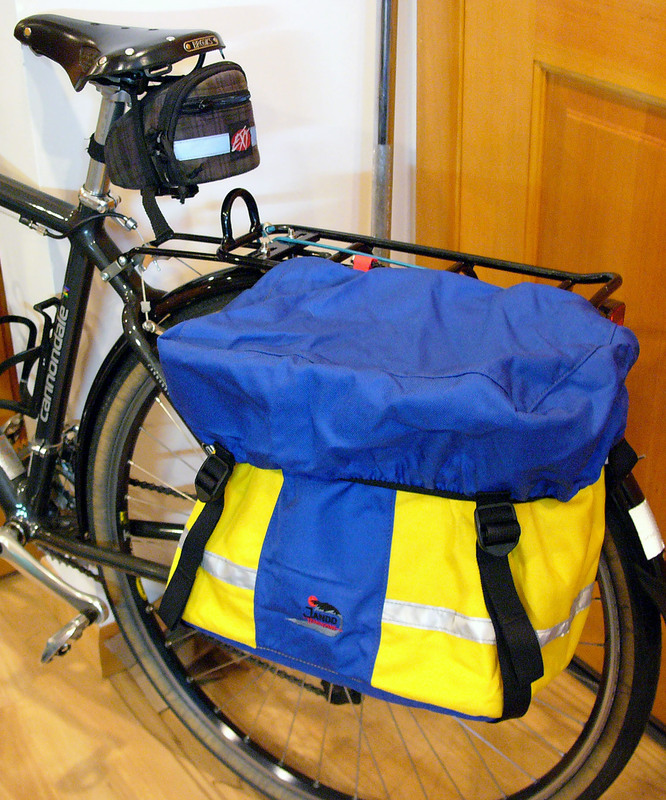 I have these smaller panniers, pictured above, as well as an older set of larger panniers. The smaller model is actually able to carry quite a bit of stuff, and I have successfully loaded these panniers with way more than I would have anticipated, so I use the smaller bags pretty much all the time. Electra Ticino Large Canvass Panniers – I hate these bags and have them sitting in my shop – awaiting some kind of disposition that I haven’t thought of yet. The bags are narrow, heavy, and feature the worst mounting system I have ever seen. After having these bags pop off the rack while riding at speed, and thankfully not crashing as a result, these bags are on my s$#t list. Detours seatpost mount quick release bags – I own three of these bags. 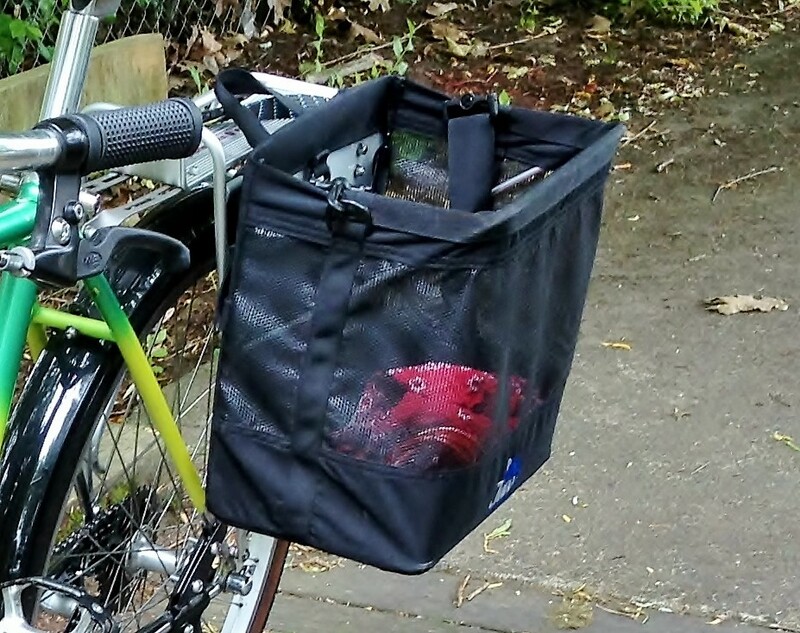 These are excellent bags for bikes which cannot take rear racks. However, based on a recent search it looks like these bags are no longer offered by the company. That’s too bad as I find these bags quite useful. They are not as big I would like, but can still hold enough stuff for a day’s adventure. Sackville Bags from Rivendell For awhile I used these Sackville front and rear rack bags, which I purchased from Rivendell. The color scheme went well with my 1973 Jack Taylor Tourist. However, these bags have no internal pockets, are not expandable, and so are of very limited utility. They do have visibility, as you can see from the above photo. Because of their limitations, they are sitting in my shop now awaiting some purpose in their lives which I haven’t thought of yet. While too numerous to list here I have tried out many different kinds of cycling bags. Trunk bags, which I used for a time, put the weight up high and also make it difficult to throw a leg over (depending on how tall your rack is). I no longer use trunk bags at all. Saddlebags often interfere with your thighs while pedaling, and can also swing from side to side while you are climbing. 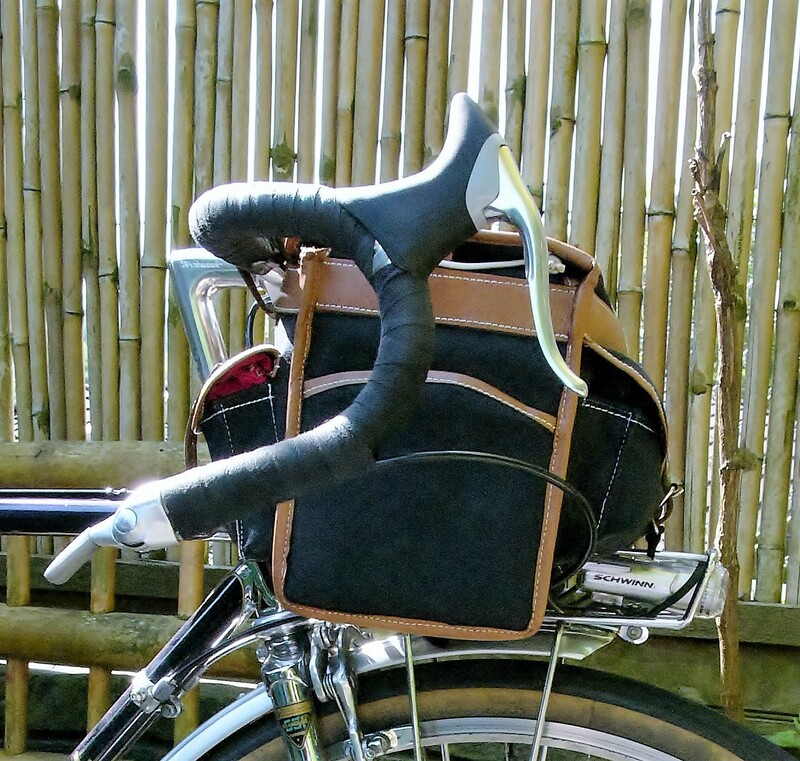 Mostly, I only use saddlebags on bikes that I will not ride vigorously, and where I can position the bag to sit far enough away from my legs – mostly this would be on larger bicycle frames. For most riders, carrying weight on the rear of the bike will feel the most stable and natural, but it is is a good idea to think about your bike’s geometry and purpose before embarking on a new bag/rack experience. 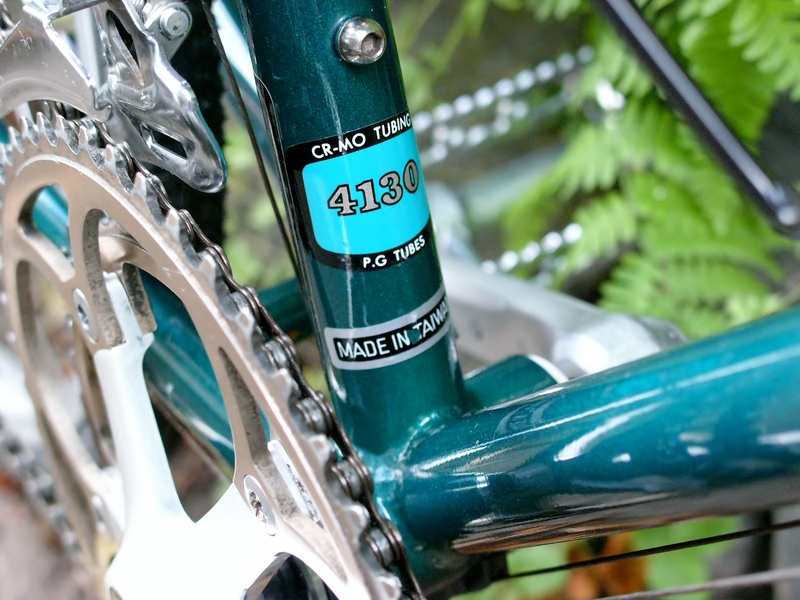 You can measure your bike’s angles by using an angle finder, and you can take a rudimentary trail measurement of the front fork rake by following instructions which are readily available on the internet. In the past few weeks, I have had the opportunity to see two of my former bikes back out on the road. 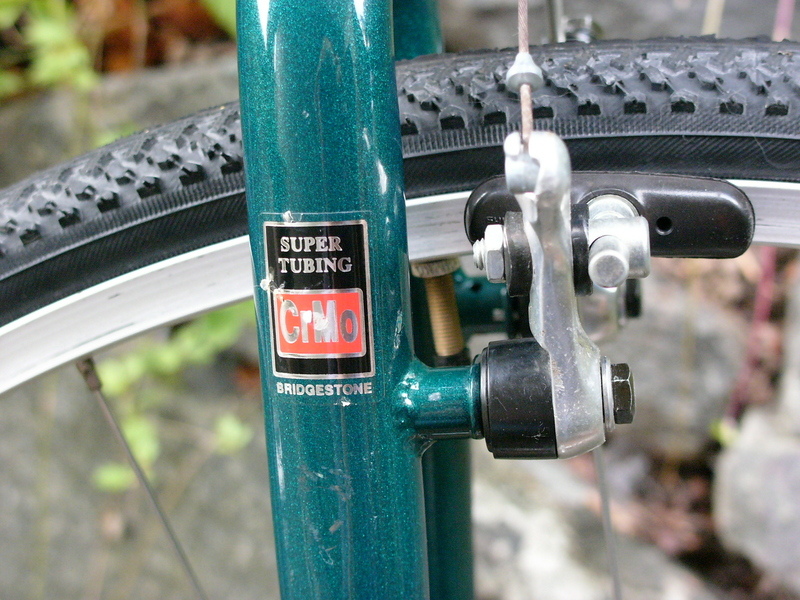 This Bridgestone XO-5 was a great bike, and suffered only from low end components. 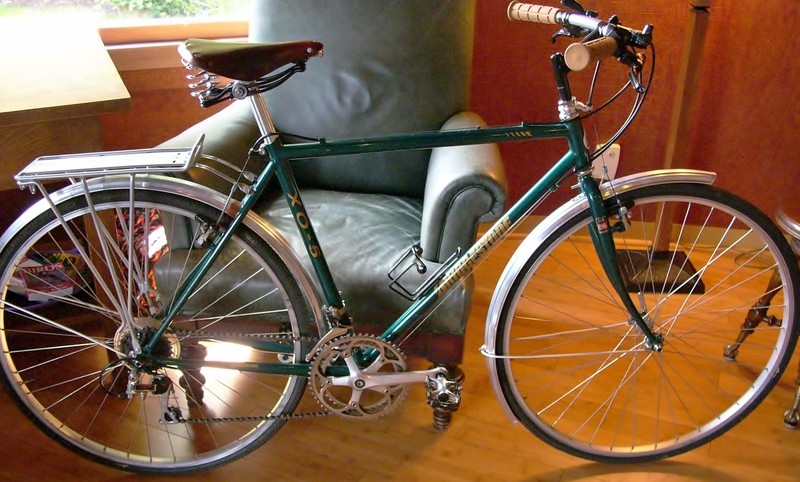 I originally planned to keep it, after upgrading the drive train with a SunTour Sprint crank (with color matched gold chain rings), adding aluminum fenders and Brooks saddle, and few other features. But, the frame was a tad too big, so I sold it a few years back. To my surprise, I spotted the old XO-5 on my commute route, the first time while riding my Terry. The bike and rider passed me in a blur of speed. I started a sprint to try to catch up, but bike and rider were gone in no time, passing ALL other riders out there – even the big ones on their fixed gear bikes. Then, about a week later I saw her again, and was able to speed up to catch her as she passed me (riding the Meral this time). I let her know that she was riding my old bike, and I learned that her husband had purchased it (from me) a few years back and given it to her as a Mother’s Day gift. She rides it every day, and quite well from what I observed. It was fun to connect with her. She loves her bike! Around this same time, I saw a bike photo posted on the Society of Three Speeds blog, with a frame that looked so familiar. 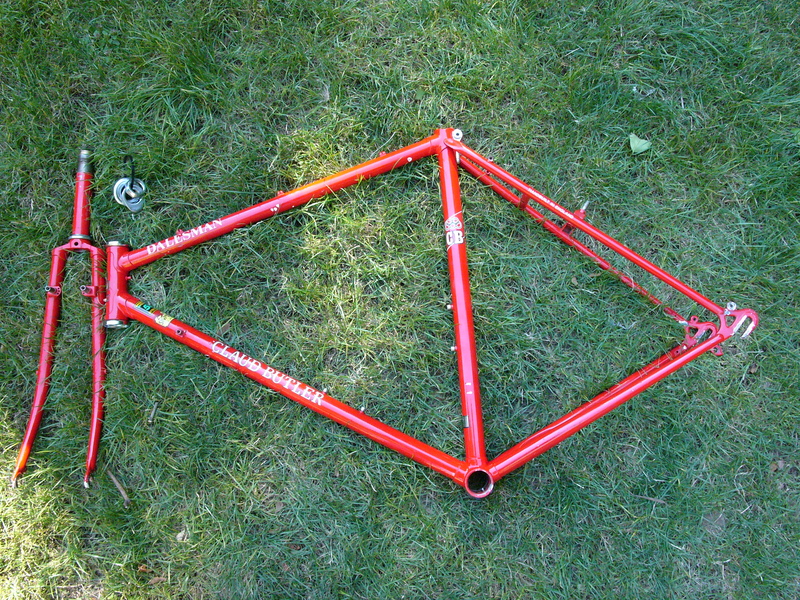 I had donated this Claud Butler Reynolds 531 frame and fork to the Community Cycling Center last summer. When I originally purchased this 80’s touring machine, the bike looked terrible and had clearly been neglected. After dis-assembly and cleaning, the frame looked fantastic, but the steerer tube’s threads were damaged beyond repair, having been fixed with brass filler once before. So I decided to let someone else have a go at this nice old frame, and here is the result. This is another great example of a thoughtful reinterpretation. The new owner used an internal hub for the gearing, and a front dynamo hub to provide lighting, plus a nice new chrome fork. 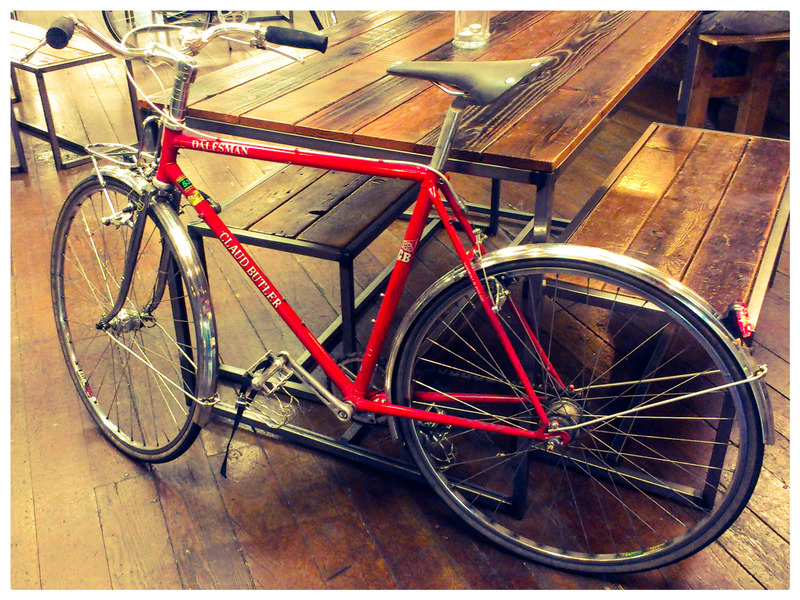 It looks fantastic, and I hope to someday meet the owner of this great bike. The joy of seeing these bikes being put to daily use, and treasured by their owners cannot be surpassed, except maybe when I am riding one of my own lovely machines.